The Gears franchise has always been a pretty popular choice when it comes to co-op games around these parts (but is it the MOST popular?? ), and Gears of War 4 certainly didn't disappoint. 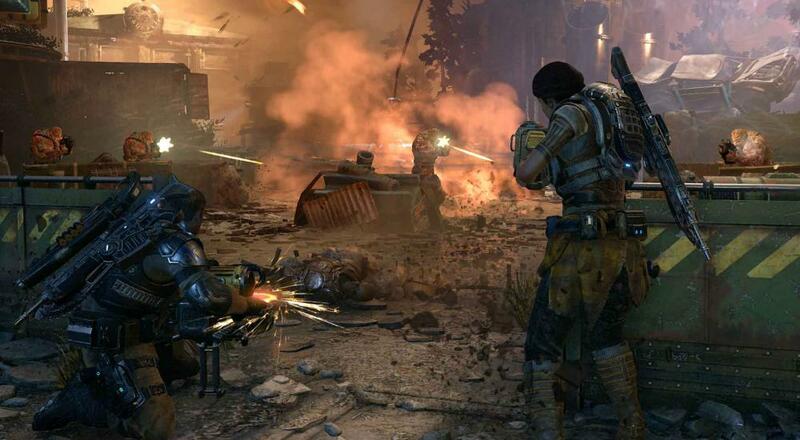 Two player drop-in/drop-out online or couch co-op is supported throughout the campaign, and five player online co-op is supported in the Horde 3.0 mode. It's worth noting that the Xbox One version of the game supports combo co-op for Horde (i.e., couch co-op and online co-op can mix), but the PC version doesn't. We've got a Co-Op FAQ that covers all the various ins-and-outs when it comes to the overall "Co-Op Experience." Gears of War 4 was one of the first Xbox Play Anywhere titles when Microsoft revealed that system back in 2016. This means that not only does it support cross-platform play between Windows 10 PC and Xbox One, but also cross-platform saves. It also grants you access to the title on both platforms, regardless of which one you buy it for, so if you've got an Xbox Live Gold sub but want to play it on your Windows 10 PC this weekend, then you should be able to do so. Once you're done checking it out for free, and if you're interested in picking up the full thing and would like to support Co-Optimus, you can head over to Amazon via this link and get it from there. Page created in 0.2362 seconds.